New Solutions to Plant Problems: Soybean extraction at Land 0 ‘ Lakes, Inc., Sheldon, IA, is an energy- intensive operation. Beans must be cleaned, properly dried, tempered, cleaned a second time, fragmented, and heat-conditioned to increase smface area and distort cell walls. On the extraction side of the process, soybean flakes are extracted by repeated countercurrent percolation of hexane solvent in either a continuous or continuous-batch extractor. Energy demand for this soy processing operation is about 1000 lb of steam/ton of soybeans processed. Steam costs approximately $4.20/1000 lb. White flakes (oil extracted) are desolventized by sparging with steam. Flakes are then toasted by tray cookers, which denatures the protein and eliminates trypsin inhibitors which prevent utilization of the nutrients in feed formulations . Hot solvent vapors (170 F) coming off the desolventizer toaster (D. T.) are utilized in the shell side of a first-stage shell-and-tube evaporator. In the tube side of the evaporator, miscella (oil and solvent mixture) from the extractor is concentrated from approximately 25% to 75% soy oil. Hexane vapors and condensate are collected for reuse by shell and tube condensers using water as the coolant. A second-stage shell-and-tube evaporator concentrates the miscella from 75% to 95% oil. A disc and donut stripper further concentrates the oil to 99 + %, with less than . 05% moisture and volatiles. After concentration, the oil requires refining. Desolventizing flakes exiting the D.T. are dried, cooled, sized, and ground before being incorporated into feed formulations. Problem: Until recently, hexane was evaporated from the miscella in a second-stage evaporator at 250 F. Vapors were recovered by shell-and-tube condensers using cooling water as the service stream. When replacement of these condensers became necessary due to age, a method was sought to reclaim waste heat from the hot vapors, and reduce cooling water loads. 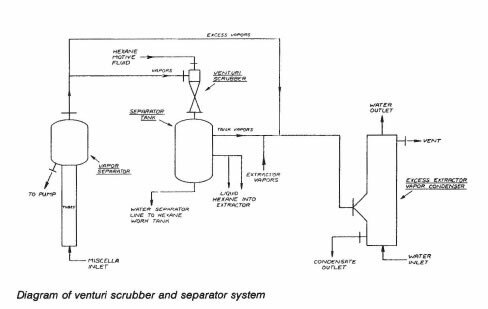 Solution: An equipment manufacturer was contacted regarding the possibility of employing venturi scrubbers. The manufacturer proposed use of a venturi scrubber and standard cyclonic separator to meet specific requirements of the process. Exact liquid hexane flow and vapor requirements were used as the design basis. Since the vapors from the second-stage evaporator are essentially pure hexane, the 2 streams (vapors and liquid) were contacted directly to condense hexane vapors and preheat liquid hexane-resulting in reduced steam consumption and cooling water loads. Liquid hexane was used as the driving force in the scrubber at a rate of 300 gpm entraining 410 cfm of hexane vapors at a negative 12″ suction draft. From past experience, it was known that surges occur from extraction drainage affecting the miscella concentration. Because of this, a condenser was installed to handle potential extractor pressurization and/or process surges. 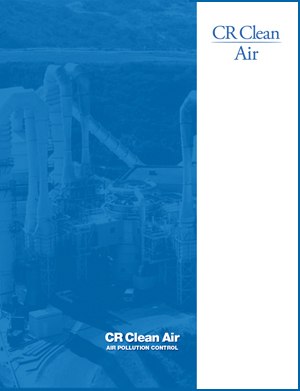 Condenser sizing is 20-25% of the total vapors generated by the second-stage evaporator, which gives the venturi scrubber/condenser system a vapor handling capacity in excess of 120-125%. 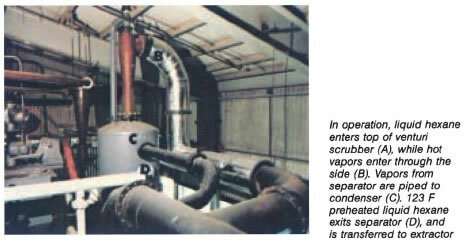 A manually controlled damper was installed in the ductwork between the venturi scrubber and the condenser to allow flexibility in balancing the vapor flow without pressurizing the secondstage, ductwork, or extractor. Results: The venturi scrubber and separator system has the flexibility to handle up to 850 cfm of vapors at a motive hexane flow rate of 375 gpm, or llOO cfm at 419 gpm, respectively. By reclaiming waste heat from hot vapors for preheating liquid hexane, Land 0′ Lakes estimates a savings of $28,000 in steam costs/yr in their extraction operation. Taking into account the total cost (venturi scrubber, separator, piping and ductwork modifications, pumps, and labor), the system paid for itself in about 15 mo. By: Anton A. Vacinek, Plant Operations Manager – Soybean Processing Div., Land 0′ Lakes, Inc.